November 1924: Knockananna graveyard, Co Wicklow. A large group of well dressed young men gathered to unveil a monument they had spent 2 years collecting money to get built. Locals looked on as former General Liam Tobin read out a few words. The men, although young in age, were old in manner & looks. They had seen death & danger, they had killed and seen their friends killed. Since 1916 most of them had led the lives of soldiers. Not as ordinary soldiers but ones who had to live every day looking over their shoulders. Any minute could be their last – as it was for Tom Kehoe on September 16th 1922. 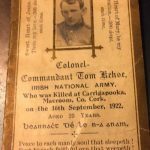 Thomas Kehoe was born on 19 November 1899 to Simon & Julia Kehoe (nee O’Toole) in Rathnagrew, Co Carlow near the Wicklow border. Julia had been married to Michael McDonnell till his death from pneumonia in 1897. She wed Simon Kehoe in 1898. According to the late Shay Courtney, Tom moved to Dublin in 1914 to work for the Great Northern Railway, possibly as an apprentice Fitter-Turner. Tom would later work in an IRA bomb factory machining the necks of grenades on a lathe; highly skilled work, which seems to confirm what Shay said. Tom joined E Company of the Second Battalion. He fought in Jacobs in 1916, alongside his half-brother Michael McDonnell (1899-1950) who was in F Company, Second Battalion. Tom surrendered with the rest of his garrison on the 29th of April. He was released after a couple of days along with Vinnie Byrne (also E Coy 2nd Battalion & also in Jacobs) due to his age. Early in 1917 the Irish Volunteers started to regroup under the new name of the Irish Republican Army. Weapons and ammunition were almost non existent, so raids for arms were taking place all over the country. And bomb-making was tried as well. Tom worked at making those weapons in the IRA facility in Aughrim Street where his skills were put to full use. I think this picture brings home the youth of these men who fought for Irish freedom. L to R: Tom Kehoe, Unknown, Jim Slattery. The Squad was formed on 25 September 1919. The original members were Sean Doyle, Paddy O’Daly, Mick McDonnell, Joe Leonard, Ben Barrett, Jim Slattery, Vinny Byrne and Tom Kehoe. Also – and this seems to be forgotten – the original Twelve included the Tipperary men on the run in Dublin – Dan Breen, Sean Tracey, Seamus Robinson and J. J. Hogan. There appears to be a few different ideas about who was the leader of the Squad at first. The most common view is Mick McDonnell. Mick was sent to America for health reasons, he had a breathing problem. There were rumours of a nervous breakdown or even an affair that went wrong. But his pension record confirms his lung problem which was the reason Collins sent him to America for a less damp climate. After Mick left, Tom Kehoe seems to have taken control of the Squad as O’Daly was interned at the time in Ballykinlar. When O’Daly managed to get released he took control of the Squad as O/C. Most Squad operations then seemed to have taken place as 6 man teams under the leadership of Joe Leonard, Jim Slattery and Tom Kehoe. Squad Members L to R Mick McDonnell, Tom Kehoe, Vincent Byrne, Paddy O’Daly & Jim Slattery. The most famous act associated with the Squad is Bloody Sunday. 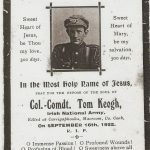 Tom Keogh was a member of the team who shot Lieutenant McMahon at 22 Lr Mount Street. Legend has it Kehoe made a date with the housemaid of the house; also when running from the building under gunfire he dropped a revolver which he ran back for. It should also be noted that Tom Kehoe was included in the crew of the armoured car that attempted to rescue Sean MacEoin from Mountjoy Jail. Tom was there because he was known to have a cool head, which paid off when a sentry open fire on the crew inside the Prison grounds and Kehoe took him out with a single shot from his Peter the Painter. A whole post here could be filled with the story of the Squad and we will do so in the future. Here is a short list of some of Tom Kehoe’s actions during the War of Independence. Raid on the Northern Railway for Gelignite. The Burning of the Custom House. Tom was captured at the Custom House and interned in Kilmainham Gaol. The British had no idea who they had just captured – if they had, he would have been in Mountjoy which was the high security prison. On release from prison Tom Joined the new National Army following Michael Collins and all the members of the Squad. He led an expeditionary force of 230 men in Wexford. He also served in Limerick where he was involved in a motor accident, when the car he was travelling in hit a ditch & Tom was pitched out over the windscreen. He sustained head injuries in that crash. While in hospital afterwards he got news of the death of Michael Collins from Phonsie, the young lad Collins had ‘adopted’. The Big Fella said in his will that if anything happened to himself Tom Kehoe was to look after the boy. Driving out of Macroom an old Castle will catch your eye on the left hand side. As your head turns to glance at it, you will miss a monument on the other hand side of the road. It honours Tom and the other men who died at that spot. There are a lot of rumours about the event, but the facts are as follows. A Free State convoy left Macroom on 16 September. It is confirmed three ex-members of Michael Collins’ Squad were involved – Tom Kehoe, Jimmy Conroy and Johnny Wilson (Conroy had been at Beal na Blath a few week earlier at the ambush in which Michael Collins was killed). Jim Slattery may also have been aboard – he states he was with Kehoe at the time of his death. That would make four ex-Squad men together. The purpose of the convoy? Well there are three versions why they went to Carrigaphooca that day. Version one. They were scouting for republicans. Version two. They were told there was a mine in the middle of the road there and went to dispose of it. Version three. They were heading to Kerry to reinforce Paddy O’Daly’s forces. They came across a mine in the middle of the road and tried to make it safe. I think this is the reason why they were there, as it’s on the main route from Macroom to Kerry. Also Kehoe had been in Kerry a few weeks before. Whatever version is true, the facts remain. The convoy stopped when they spotted the mine. There were leads coming from it and Tom Kehoe supervised them being disconnected from the detonator. Some young privates who had just been recruited into the army lifted the mine. But it was rigged by wire to a hand grenade (one theory) or a second detonator (again could have been a grenade). When the thing was lifted it went off – instantly killing Captain Dan O’Brien, Sgt William Murphy, Volunteers Thomas Manning, John O’Riordan, Patrick O’Rourke & Ralph Conway. Col. Comdt. Tom Kehoe was severely injured by the blast. He died later that night in a hospital in Cork City. He was just 23 years old. Close up of the names on the cross. Something that was missing from the grave for a few years (it was not there before the restoration) – a personal tribute from Vinnie Byrne. After his death the Irish Army paid three important tributes to him. The first two involved re-naming armoured car ARR1 ‘Danny Boy’ as Tom Keogh; and ARR14 as Knockananna (after Tom’s burial place). The third was to call the old Richmond Detention Barracks in Inchicore, Keogh Barracks. The place was later used as public housing and renamed Keogh Square till its demolition in the late 1960’s to make way for St Michael’s Estate (itself since is being redeveloped). The remaining barracks building is now a museum dedicated to the memory of the men and women of 1916 who were locked up on the site. Tom is sadly over-looked and largely forgotten. But his comrades never forgot him. I hope this small tribute helps others appreciate the sacrifices he made for his country. Sadly he is a forgotten soldier who served his country one of many past and present who the State has chosen to leave out of our history but are just as much a patriot as those who fought in the GPO.Those of us who served in the Defence Forces during the troubles are still waiting after 20 years to be recognised by the State for our loyal service to the people of Ireland,we have been airbrushed out of our Country’s history and deliberately so. On the RTE report of the death of Charlie Haughey’s widow she was called a patriot? A great tribute to a great man. Never knew the full story. Mary Collins Powell, sister of Michael, was with Tom when he died. She cut a lock of his hair and sent it in a letter to Toms mother in Knockananna.